What was life like for the first Buddhist monks? How did these followers of the historical Buddha become ordained and what rules did they live by? Though the actual story is shrouded a bit by the passing of centuries, the story of these first monks is fascinating. In the beginning, there were no monasteries, just a wandering teacher and his tag-along disciples. In India and Nepal 25 centuries ago it was common for men seeking spiritual teaching to attach themselves to a guru. These gurus usually lived either in simple forest hermitages or, even more simply, under the shelter of trees. The historical Buddha began his spiritual quest by seeking highly regarded gurus of his day. When he realized enlightenment disciples began to follow him in the same manner. 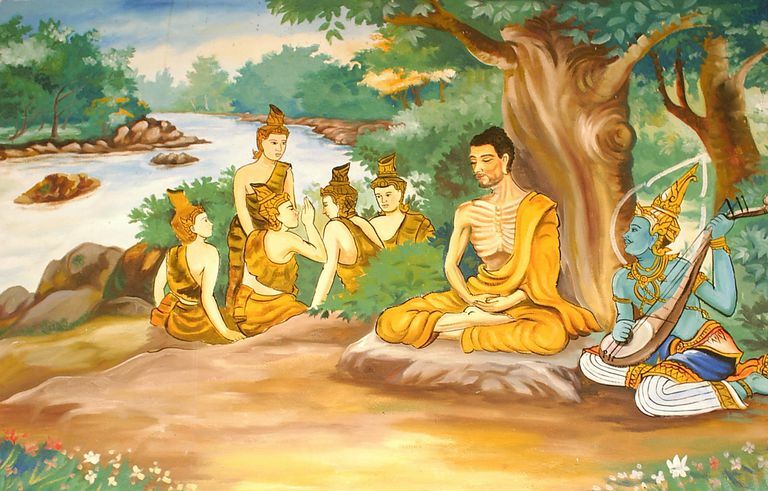 The Buddha and his first disciples had no fixed place to call home. They slept under trees and begged for all of their food. Their only clothes were robes they patched together from cloth taken from rubbish heaps. The cloth was usually dyed with spices such as turmeric or saffron, which gave it a yellow-orange color. The robes of Buddhist monks are called "saffron robes" to this day. At first, people who wished to become disciples simply approached the Buddha and asked to be ordained, and the Buddha would grant ordination. As the sangha grew, the Buddha established a rule that ordinations could take place in the presence of ten ordained monks without his having to be there. In time, there came to be two steps to ordination. The first step was home-leaving. Candidates recited the Ti Samana Gamana (Pali), "taking the three refuges" in the Buddha, the dharma, and the sangha. Then the novices shaved their heads and put on their patched, yellow-orange robes. These ten rules were eventually expanded to 227 rules and recorded in the Vinaya-pitaka of the Pali Canon. A novice could apply for full ordination as a monk after a period of time. To qualify, he had to meet certain standards of health and character. A senior monk then presented the candidate to the assembly of monks and asked three times if anyone objected to his ordination. If there were no objections, he would be ordained. The only possessions monks were allowed to keep were three robes, one alms bowl, one razor, one needle, one girdle, and one water strainer. Most of the time they slept under trees. They begged for their food in the morning and ate one meal a day at noon. Monks were to gratefully receive and eat whatever they were given, with a few exceptions. They could not store food or save anything to eat later. Contrary to popular belief, it's unlikely that the historical Buddha or the first monks that followed him were vegetarians. The Buddha also ordained women as nuns. It is believed to have begun with his stepmother and aunt, Maha Pajapati Gotami and the nuns were given more rules than monks. As explained earlier, monks endeavored to live by the Ten Cardinal Precepts and the other rules of the Vinaya-pitaka. The Vinaya also prescribes penalties, ranging from simple confession to permanent expulsion from the order. On days of a new and full moon, monks gathered in an assembly to recite the canon of rules. After each rule was recited, the monks paused to allow for confessions of breaking the rule. The first Buddhist monks sought shelter during the rainy season, which lasted most of the summer. It came to be the practice that groups of monks would stay somewhere together and form a temporary community. Wealthy laypeople sometimes invited groups of monks to be housed on their estates during the rainy seasons. Eventually, a few of these patrons built permanent houses for monks, which amounted to an early form of the monastery. In much of southeast Asia today, Theravada monks observe Vassa, a three-month "rains retreat." During Vassa, monks remain in their monasteries and intensify their meditation practice. Laypeople participate by bringing them food and other supplies. Elsewhere in Asia, many Mahayana sects also observe some form of three-month intensive practice period to respect the rains retreat tradition of the first monks. The historical Buddha is said to have delivered his first sermon to only five men. By the end of his life, the early texts describe thousands of followers. Assuming these accounts are accurate, how did the Buddha's teachings spread? The historical Buddha traveled and taught through cities and villages during the last 40 or so years of his life. Small groups of monks also traveled on their own to teach the dharma. They would enter a village to beg for alms and go from house to house. People impressed by their peaceful, respectful nature would often follow them and ask questions. When the Buddha died, his disciples carefully preserved and memorized his sermons and sayings and passed them on to new generations. Through the dedication of the first Buddhist monks, the dharma is alive for us today. What is the First Precept in Buddhism?